On August 5, Häagen-Dazs will celebrate the grand opening of its newest retail location in Manhattan at 55C E 8th Street (between Mercer & Greene) with a giveaway. 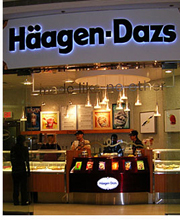 To celebrate the occasion, Häagen-Dazs will award one customer with free ice cream for a year. Plus, during the grand opening celebration, Häagen-Dazs will give customers in attendance free scoops of their favorite ice cream flavors during its regular business hours, 11 a.m. to 11p.m. A New York original, Häagen-Dazs was born on the streets of the Bronx when founder Reuben Mattus began selling ice cream pops from a horse drawn wagon. The brand has a history in the city dating back 50 years ago. The company’s first retail shop opened in Brooklyn on Montague Street in 1976 and is still in operation today.